The panels are used in process plants for plant automation purpose. All types of panels like control room panels, mimic panels, annunciation panels and DCS consoles are manufactured by us. We design, select and supply complete instrumentation required for such Instrumentation panels with instruments like indicators, controllers, recorders, annunciators and many process instruments. We are manufacturing PLC Base Control Panel with high-quality of raw material. This panel is manually operated. It has push button in cylinder to start automatically. 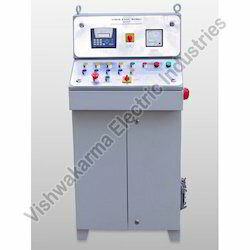 It has programmable logic controller, which is mainly used for the process of automation. They are very easy to operate. It has Anodized Aluminum Frame. These products are also having remote control facility. They are very stable. These panels are providing high output. Looking for PLC Based Control Panels ?